Science and art expressed through gardening. Fig. 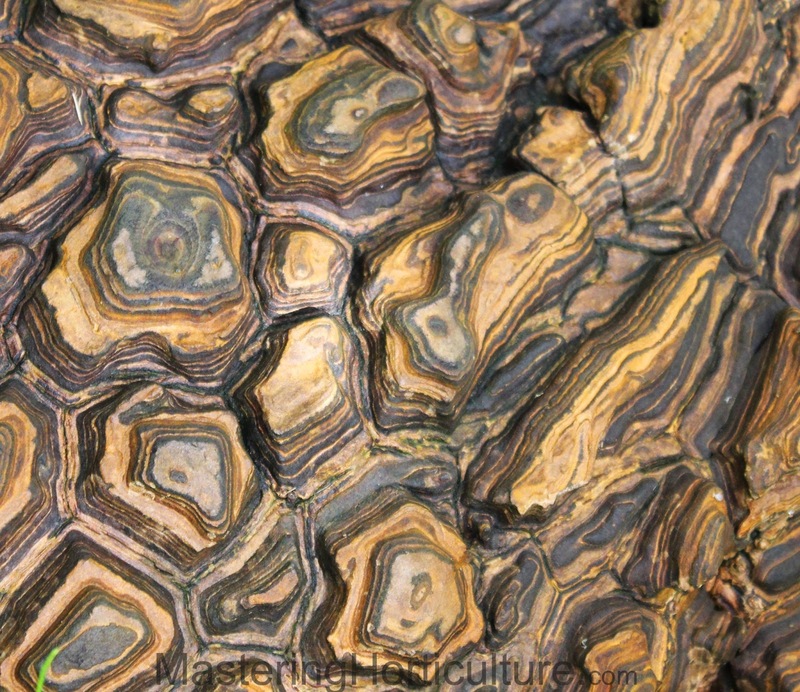 1 Caudex on close-up view - resembles a tortoise shell. 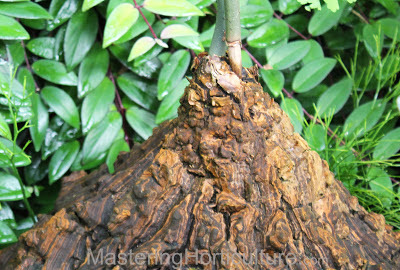 The caudex which is the thickened and enlarged base of the stem is what gives this plant an extraordinary visual appeal. Part of the caudex grows above-ground exposing a hardened outer layer that resembles a tortoise shell . 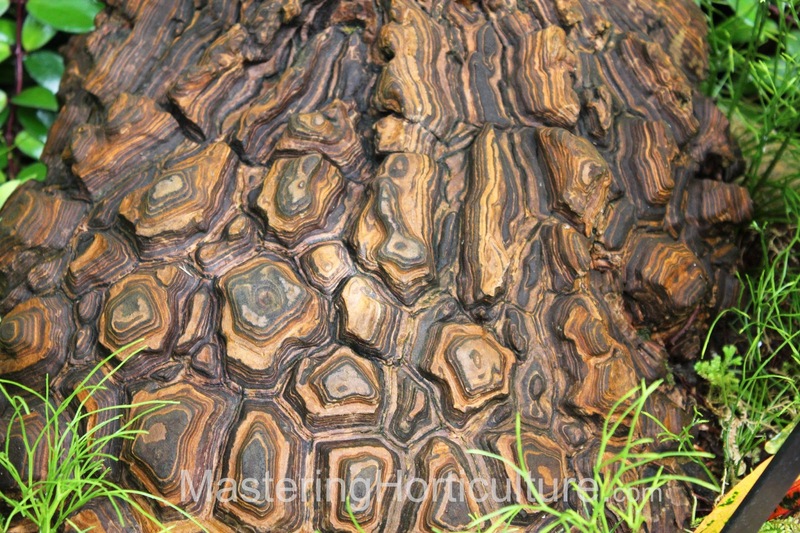 As the caudex expands, the hardened layer breaks into almost regular polygonal plates that becomes protuberant with age leaving deep furrow in between (Fig. 1). The pictures here are images of the specimen Dioscorea macrostachya at the Conservatory of Flowers in San Francisco. From the appearance of the stem and leaves, this perennial plant looks like and ordinary vine (Fig. 2). Capable of growing up to 36 feet in a year, this plant is a vigorous grower. Unless you take the time to guide your eyes to follow where the vine originates, it would be so hard to imagine that the caudex below (Fig. 3) is related to the far-reaching vine with the heart-shaped leaves. Fig. 3 Branches arising from the caudex. As a normal sequence of events, every year, a new set of branches emerge from the apical end of the caudex and dies back at the end of the season depending on growing conditions. In the tropical forest where this plant would be found in nature, the caudex would be sitting in the shade where it prefers to be with lots of water. Sunlight requirement for this plant is relatively moderate. The new vine would then have to reach up above the other plant canopies to access to direct sunlight. Thus a rapid growth of the vine is necessary for existence. The rate of growth of the caudex is a function of the photosynthetic rate on the foliage. 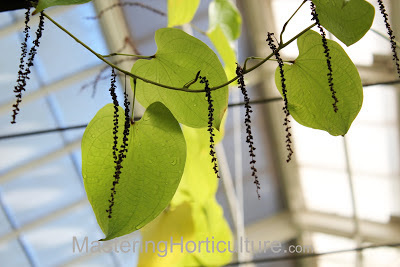 Dioscorea macrostachya is grown as an ornamental plant as it adds oddity to any plant collection. Find time to walk in a garden today. My family was in San Francisco for a weekend getaway last week. Guess what places ranked high on the list of preferred destinations. Gardens. January is not the best time to see flowers but it is definitely a great time to see the bones that makes a beautiful landscape. 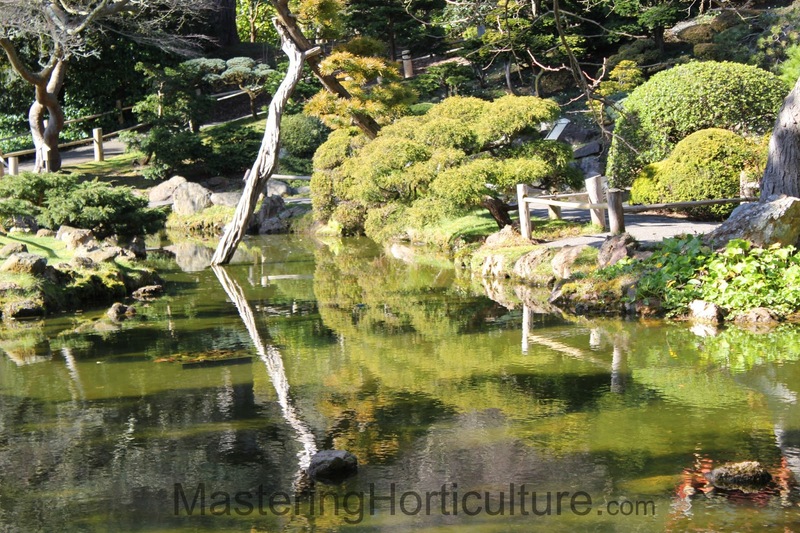 We toured most of the horticultural points of interest inside the Golden Gate Park. One of the places we went to see was the Japanese Tea Garden, which is claimed to be the oldest public Japanese garden in the country. What is A Tea Garden anyway? 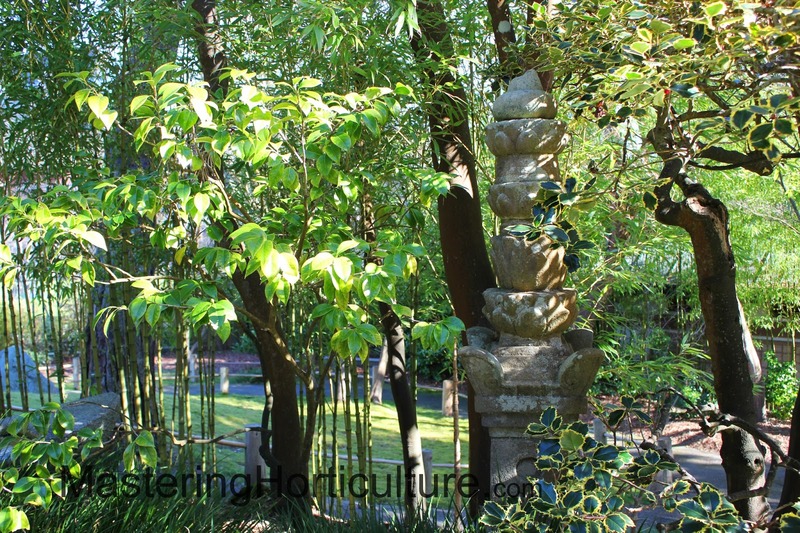 Originally, a tea garden was intended to be a serene place to prepare the mind prior to entering the tea house. In the tea house a tea ceremony (as taught by Sen no Rikyu) is performed. By design, the tea garden avoids artificiality in an attempt to emphasize the natural appearance of the environment. 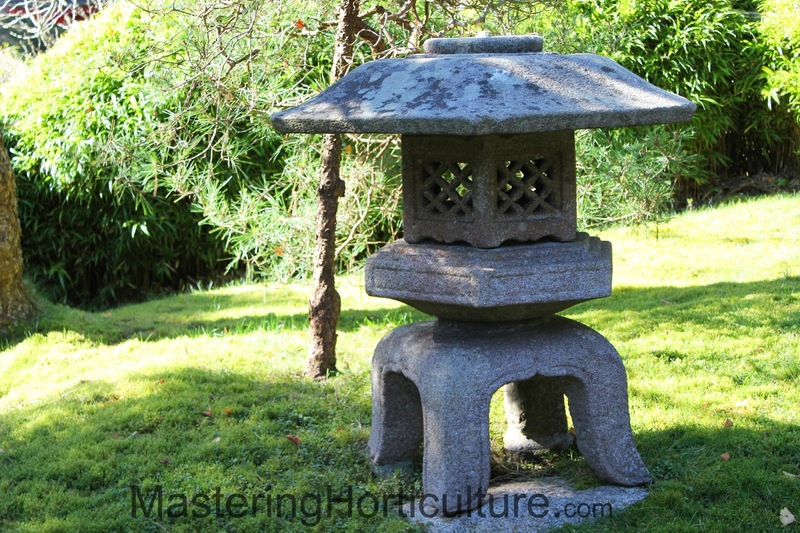 According to literature, the stone lantern, stepping stones, clusters of trees and shrubs, and gazebos that are incorporated in modern-day Japanese gardens have their origin in the tea garden. The Japanese Tea Garden in San Francisco successfully integrated all the mind-calming elements of a ceremonial garden. Although they do not offer Tea Ceremonies at this time of the year, they offer an excellent selection of teas at the gazebo. We tried some of their teas and enjoyed a tray of mochi. 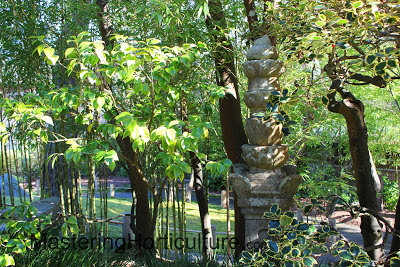 However, with the number of tourists milling around, one can hardly experience the garden-inspired peace and meditation. Thank goodness we were there for the aesthetics and not the spiritual experience. The lack of flowers forced me to focus on the characteristics of a Japanese. I thought about the serene look of the garden and what contribute to all that. A few things stuck out. The garden mimics natural landscapes but presented in reduced scale. 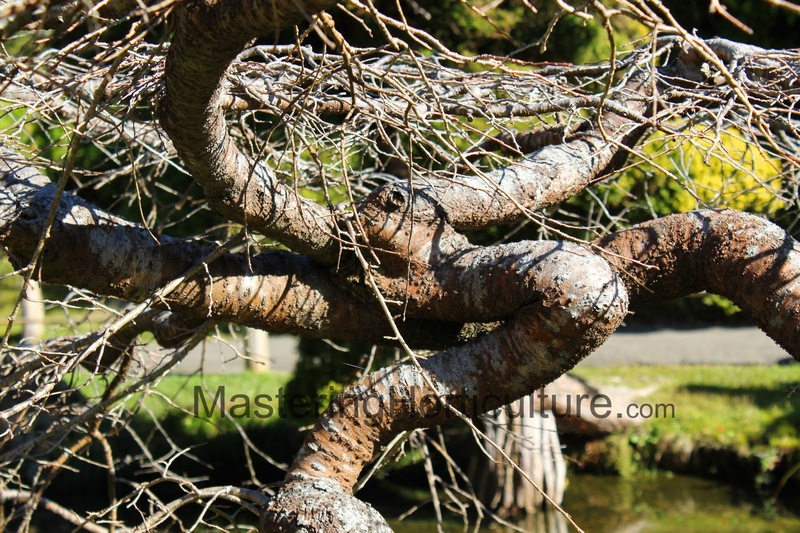 The trees are severely clipped and controlled to regulate their size. 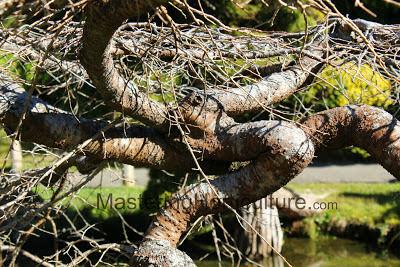 That is why topiaries are prominent fixtures in Japanese gardens. 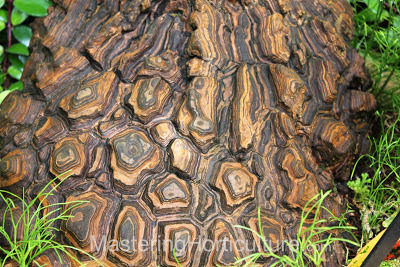 Stones, used to mimic larger things in nature, are spread throughout the garden. 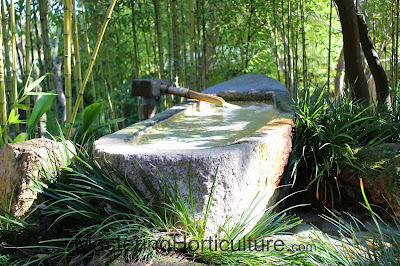 I noticed that water is an essential element of the garden. 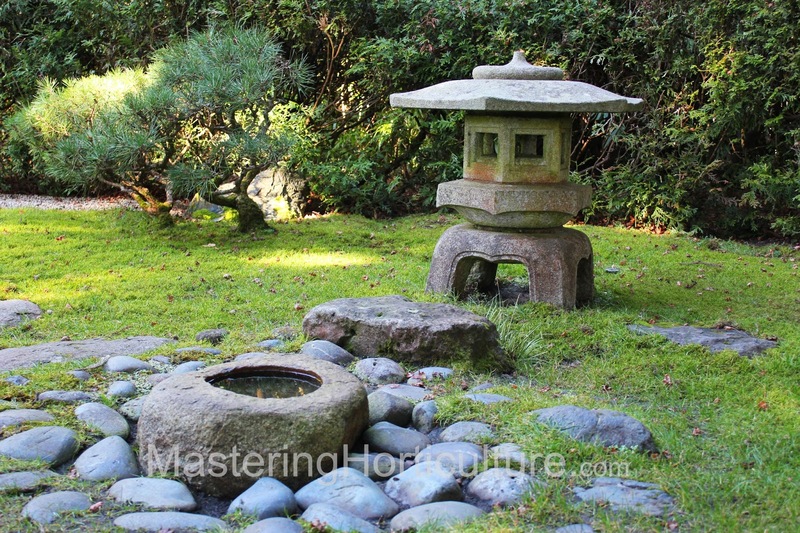 Fountains, ponds, and miniature-falls bring coolness to the garden. 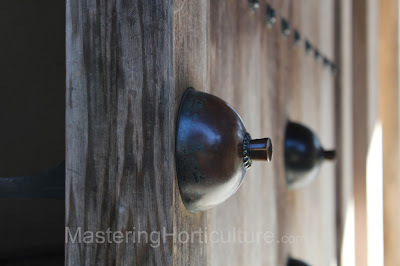 Metal and wood combined give a sense of strength on the gate..
Sound and motion from water fountains contribute to the calming effect of the garden. Stone-trough and rocks give the impression of permanence while mimicking views of boulders and ponds. Intricate details on buildings add elegance to natural construction materials. 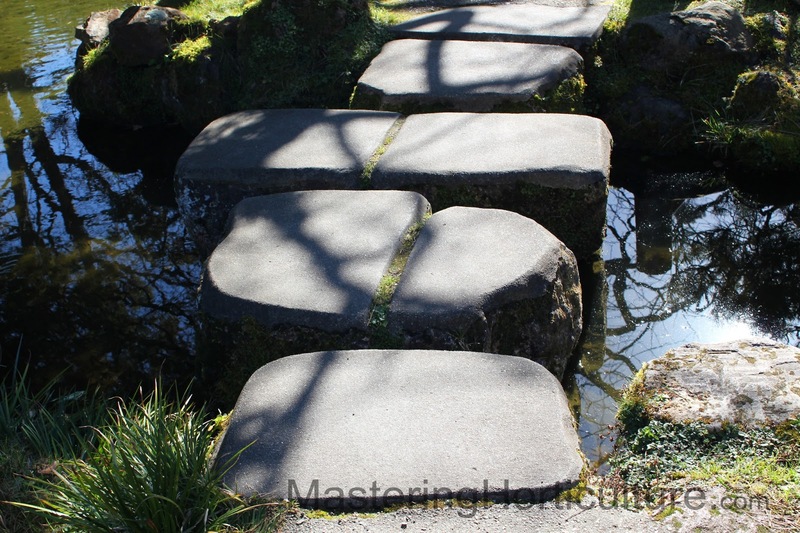 Stepping stones suggest a regulated walk in the garden - allowing time to appreciate the surroundings. 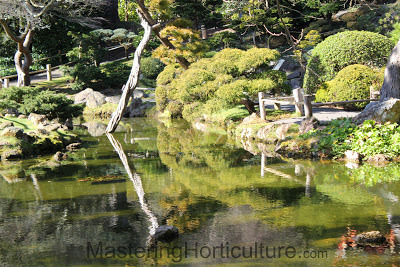 Still waters multiply the effects of the garden elements. Gardens that are mature are a great source of inspiration. Take the time to stroll them. Super Bowl 2013: Go 49ers! 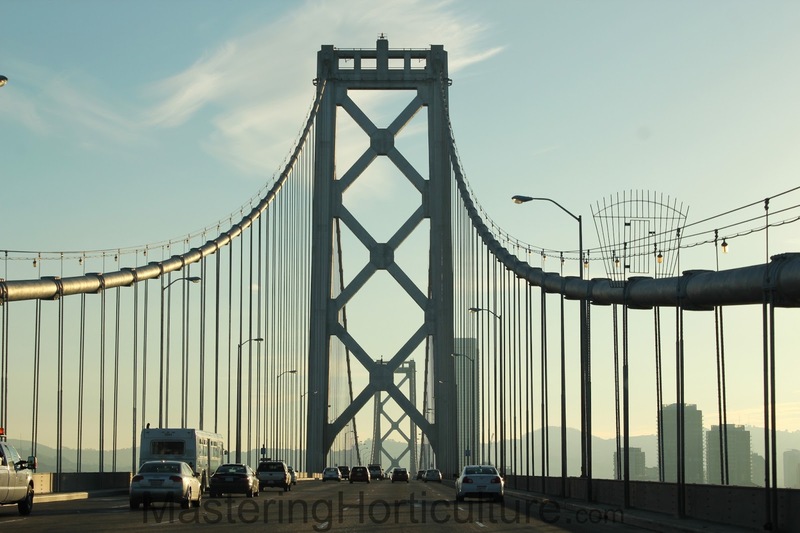 We were in San Francisco last week visiting some of the horticultural points of interest at the Golden Gate Park. 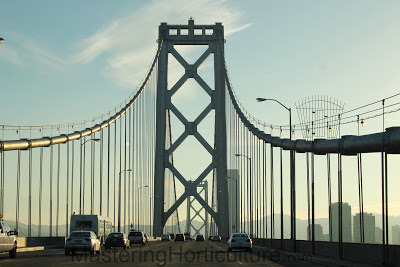 As we approached the Conservatory of Flowers we saw recent plantings of succulents (Echeveria spp.) on both sides of the stairs that lead to the building. The city is very proud of its team. People show their support with their T-shirts, cars, cakes, hats...but the one that I favor the most is the one that is expressed through the gardens. The green thumb is a myth but dirty hands are real. I believe that every person is a potential gardener. A garden whether in a pot or in a farm should be a part of every home. 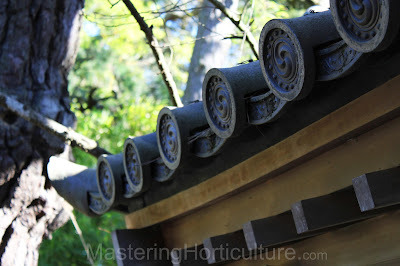 In the fall of 2009 I started blogging about the things I do in my garden including my observations and thoughts. Depending on what's happening in the garden, I also include scientific explanations to some observable occurrences. I hope that this blog will encourage and build confidence to anyone who's attempting to step into the rewarding world of gardening. All pictures and content are mine unless it is mentioned otherwise. Born and raised in the Philippines. Attended University of the Philippines and University of Reading, England. Now residing in California with husband and three children - enjoying a God-dependent life.